A mobile call to the UK Coastguard triggered Crew volunteers’ pagers to launch inshore D class lifeboat George Bearman II at 2pm on 24 February. A dog was trapped on a ledge on Langstone Rock, two miles west of the lifeboat station. Crew volunteers were on scene within eight minutes and discovered that the spaniel had fallen into the water during a walk and had managed to scramble onto the ledge in the strong surf. One of the Crew climbed onto the ledge and recovered the dog to the tearful owner who had wisely not entered the water herself and instead had called 999 for help. Crew volunteers gave safety advice for the future. 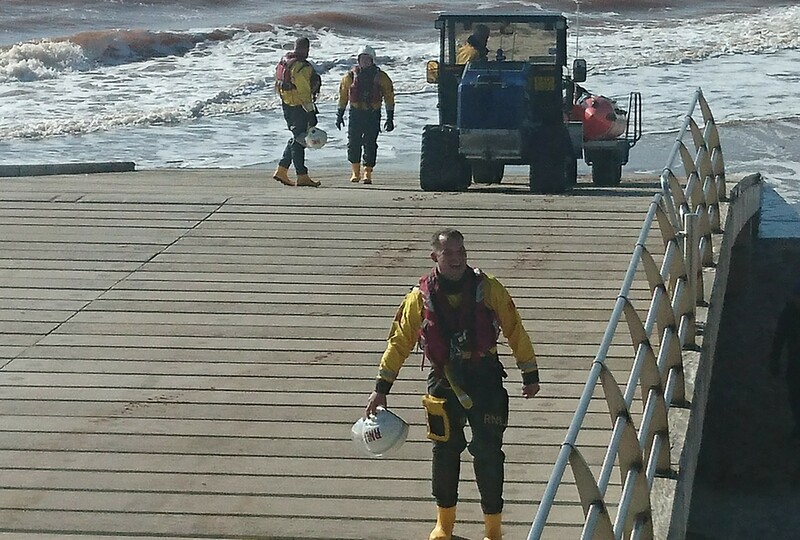 On 25 February, Crew volunteers were just ending a familiarisation training session at the lifeboat station when they witnessed a kite-surfer half a mile west of the boathouse. George Bearman II launched at 12.10pm to investigate. On scene within two minutes, Crew found the kite-surfer had been separated from his board and was grateful to be recovered ashore to the beach to safety. The conditions were challenging with a swell of 1.5 metres and an approximate sea temperature of 8 degrees. Volunteers continued to monitor two windsurfers also thought to be in difficulty, but a further launch was not needed.